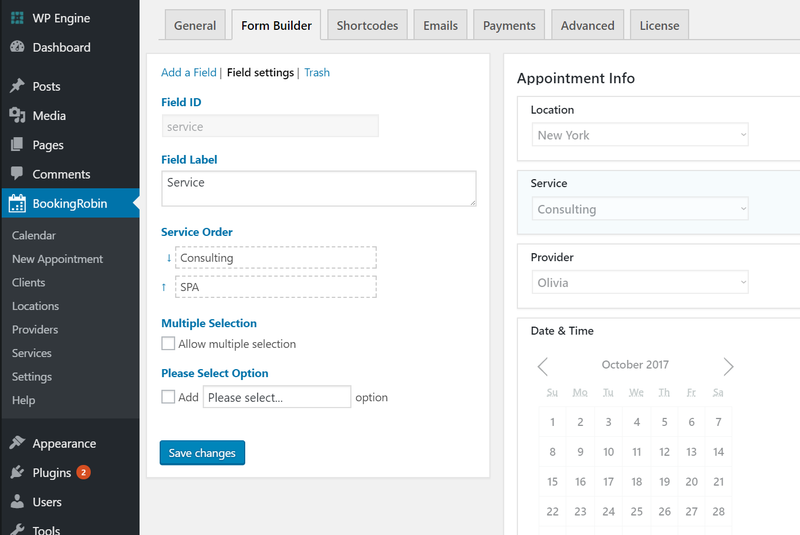 Under WP Admin > BookingRobin > Settings > Form builder, you are able to customize your booking form. A booking form is composed of four parts: Appointment Info, Notes, Your Info and Submit. Fields listed in Appointment Info and Notes sections are appointment related fields. Fields listed in Your Info section are client related fields. There are four system fields under Appointment Info section: Location, Service, Provider and Date&Time. By clicking on the field, you are able to configure field settings at the left side. For instance, as per Service field, you may edit field label, change options order, enable service multiple selection and add 'Please select' option. By default, Notes field is added in the booking form to collect extra info about the appointment. If you want to add extra appointment related fields to the booking form, add them to Notes section. To add a custom field, simply drag the field type to your preferred position in the booking form. Fields listed under Your Info section are client related fields. You may add custom fields to this section too. 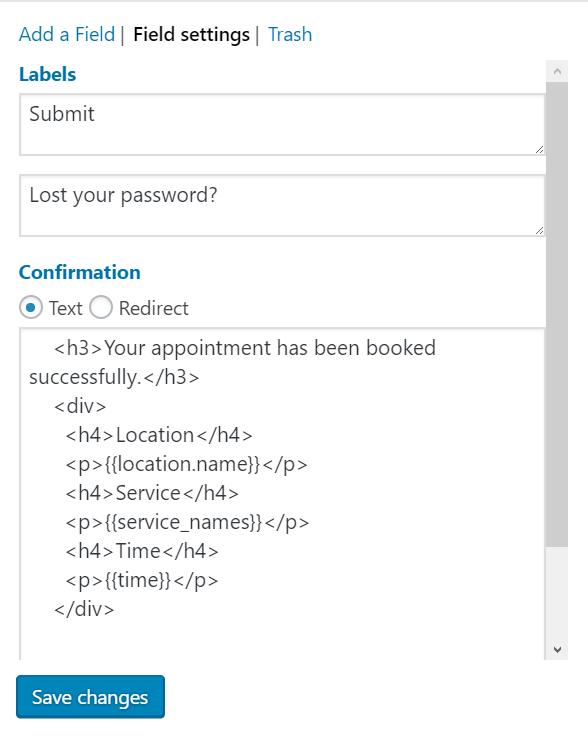 When you enable Client login and registration, your clients will be asked to input a password to make an appointment. If you disable Client login and registration, clients will not be asked to input a password when booking appointments. Email is client's ID. Please make sure you use different email addresses for different clients. Click submit button, on the left side > field settings part, you may customize your confirmation page content. Check this article for the available tags. Click Redirect, you may specify the redirect url. Scroll down the setting page, you can enable reCAPTCHA. Check this document for more info on how to set up reCAPTCHA.